Bengali weddings are an amalgamation of rituals carrying their own set of importance. These elaborate rituals, filled with lots of colours give a visual treat to our eyes. Most of the ceremonies include the blow of conch shells and ullu’r dhoni. We’ll give a glimpse of all the essential rituals by segregating them into Pre-wedding, Wedding and Post-wedding ceremonies. The first and foremost ritual is the Aashirbad ceremony. After the horoscopes are matched, the bride’s family visits the groom’s family to bless the groom with husked rice and gold. The same is followed by the bride’s family. The next ceremony is aai budo bhaat where varieties of food are placed before the bride as well as the groom, laying special emphasis on fish and an array of sweets. This ceremony remarks for the last food being offered at her home. It also refers to the last day of being single. This ritual carries huge importance as the paternal uncles of groom and bride seek blessings from the ancestors for the newly wedded couple. It is carried out a day before the wedding. 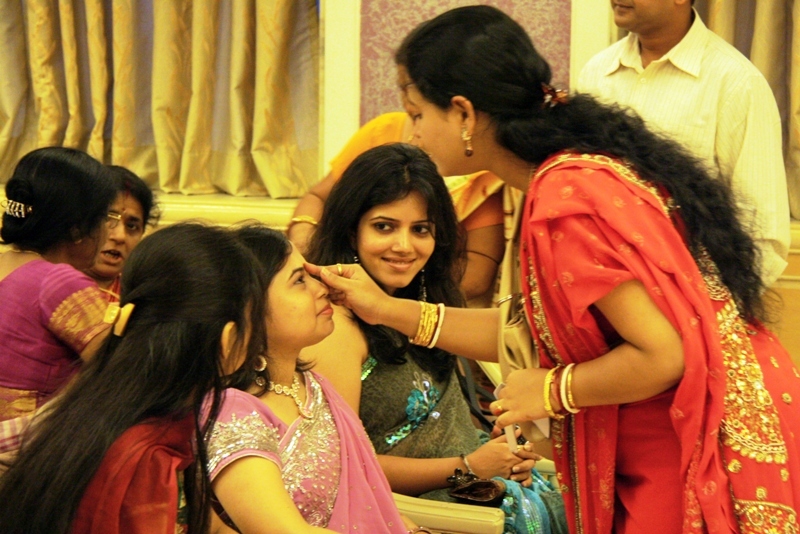 This is the applying of turmeric paste by the married women to the groom. This paste is then taken for the bride along with totto or gifts by the relatives. Dodhi Mongol: On the day of marriage, the married women of the house visit the holy river Ganga or any nearby river to fetch bathing water for the bride and the groom respectively. Next, they are given curd and rice to eat. This remains their only food until they get married. Bor Boron: The wedding begins by the welcoming of the groom by bride’s mother as soon as he reaches the venue with his relatives. He is greeted with the baran dala consisting of various items some of which include husked rice and sweets. The groom at the wedding altar is presented with new set of clothes by the bride’s family. The bride sits on a pidhi or a small wooden stool covering her face with two beetel leaves and is lifted by her brothers who can carry her around the groom seven times. This ceremony leads to shubho drishti where both the bride and the groom see each other and then follows the mala bodol where the two exchange the garlands thrice. Somprodanand Saat pak: The bride and the groom then, get seated at the mandap and their hands after covering are placed on a pot made of brass containing coconut and mango leaves. All this takes place at the back-drop of vedic chants. This is followed by moving around the holy fire seven times called saat pak. the final ceremony that completes the marriage is when the groom puts sindoor or vermillion on the bride’s hair parting. The post wedding ceremonies include bidaai, kaal ratri, bou bhaat, phool shojja and oshtomongola. Bidaai is the when the bride leaves her father’s place to go to her husband’s place. Kaal ratri is where the bride and the groom are separated from each other and are not allowed seeing. Bou bhaat: Bou bhaat is the second day the bride is at her new home and she serves rice and ghee to all her in-laws during lunch. At evening, the reception party is conducted which includes konya jatri i.e. the bride’s family comes along with totto or gifts for the bride, groom and the groom’s family. After this event follows the phool shojja when the bride wears all sorts of flower ornaments. The bed is decorated with flowers which remark a new beginning for the couple. Oshtomongola: This ritual is again very important when the couple visits the bride’s family after eight days of marriage and spends three nights there. Variety of food is given to the couple after which the opening of the gatbandhan takes place which had been tied on the day of marriage. With oshtomongola ends the essential ceremonies of a Bengali matrimony. All these rituals are considered extremely significant for the well-being of the newly wedded couple’s life and thus are followed by every bride, groom and their respective families to become one! Next article What Is To Be Considered When Purchasing Red Coral Stone?